The Iron Age in Ireland spans almost one thousand years from the end of the Bronze Age to the start of the Early Christian Era during the fifth century AD. Knowledge of using Iron metalwork gradually spread throughout Ireland from Europe where Iron was increasingly being used in metalwork. Iron became the main metal used to make tools and equipment because it is very strong – much stronger than bronze. At some point during the Iron Age the Celts invaded Ireland from mainland Europe. The Celts brought to Ireland a new culture which the native Irish adopted and made their own – celtic language, customs and Art. The new style of Art which the Celts brought to Ireland is called La Tene. This is an abstract curvilinear style of decoration. It is called La Tene – after a site in Switzerland where the earliest curvilinear style artifacts were found. This style is found over much of Europe and in Ireland, it lasted for several hundred years until the arrival of Christianity when the Irish La Tene style merged with christian designs and symbols. 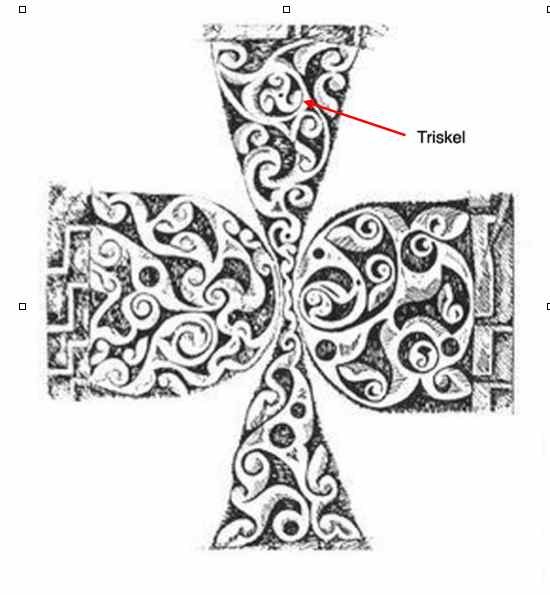 The Triskel was a very popular La Tene motif. It is a triple spiral design – a type of “sun wheel”, it was used to decorate La Tene style objects. Iron became the metal to make tools such as knives, axes and functional objects such as cooking pots and stirrups, however, bronze and gold continued to be used during the Iron Age for their beauty and because these metals do not rust or decay like Iron. The Loughnashade Trumpet dates from the 1st Century BC. It is made from sheet bronze and is over six feet in length. It consists of two tubes of bronze which are joined together in the middle of the trumpet by a bronze ring and a bronze disc that forms the bell of the horn. The two tubes of bronze that form the length of the trumpet were made by bending sheet bronze into two half cylinders which were then joined together with rivets to form a tube – the edges are sealed from the inside using a strip of bronze which is fastened along the length using rivets . There are more than six hundred rivets used in the length of the horn. At the bell of the Trumpet there is a bronze disc which is decorated in the La Tene style using the Repoussé technique of hammering the design from behind so it stood out in the front in relief. Each quadrant ( quarter ) of the disc are mirror images of each other. The design is composed of long curved lines which spiral to form high relief bosses ( rounded knobs). A number of “Trumpet Curves” are incorporated into the design which flows and curves to resemble plant-life. It is believed that this design is based on the Greek Lotus pattern. The trumpet was found in the eighteenth century, buried near the shore of Lough Shade, Co Armagh, together with a human skull and three other trumpets, which have since been lost. This lake is overlooked by the Navan Fort ( Eamhain Macha) which was one of the largest Celtic strongholds in Ireland. It is one of the earliest trumpets found in the world and still works as a musical instrument. Early Iron Age, first century bc. Drawing of Loughnashade Trumpet; detail of the La Tene design on the disc at the bell of the Trumpet. 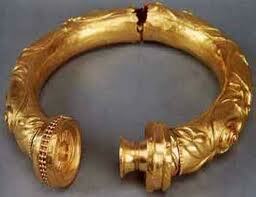 The Broighter Hoard is probably the greatest find of ancient artifacts in Ireland. It was uncovered in Co Derry in 1896, when land near the shores of Lough Foyle were being ploughed. The “ hoard’ consists of a model boat with oars and mast, a bowl, two chain necklaces, two rod twisted torcs and a hollow collar. 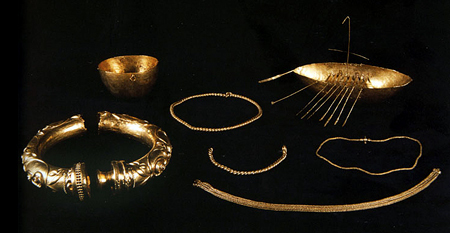 All these objects were made in gold, which had become much a more rare and precious metal in Ireland than in the Bronze Age. The Broighter Boat and Broighter Collar are famous irish prehistoric artworks. The boat is very unusual for Iron Age Art in that it is not abstract- it is a beautiful representation of a prehistoric boat complete with mast and oars. The collar is one of the finest examples of la Tene metal craftmanship in Europe. This hollow collar is made from two plates of thin gold soldered together in tubular form and bent into a circular shape to fit around a neck. 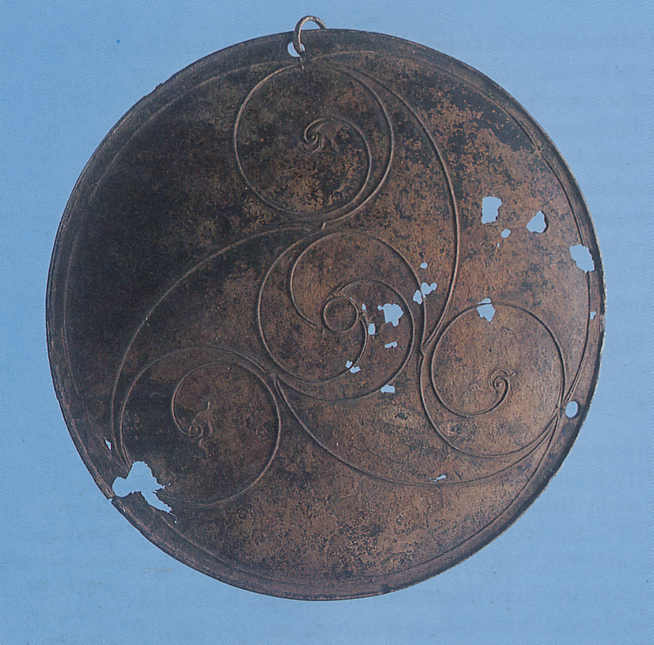 The La Tene style decoration was made using the repousse technique ( punched from behind). 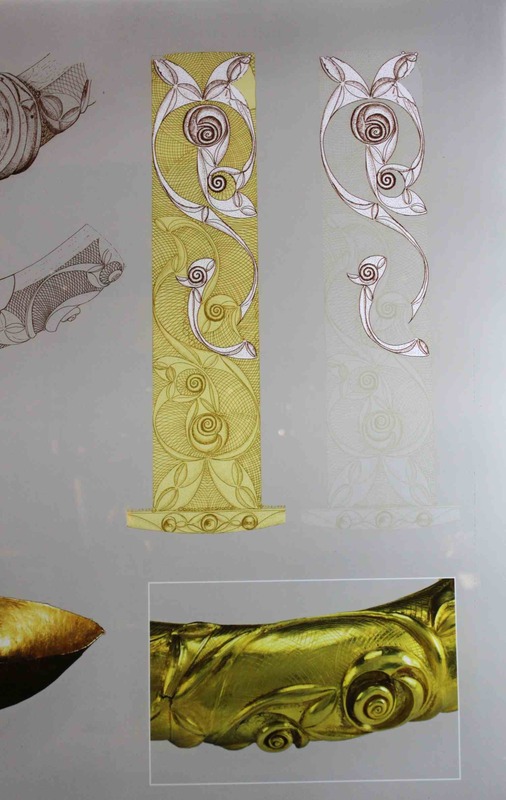 This repousse design would have been hammered into the gold sheets before they were made into a tube. The design consists of trumpet shaped patterns and lentoid bosses ( a boss is a lump or knob, and lentiod means its oval or lens shaped and not circular). These are all linked together with flowing curved lines that make the design resemble a climbing plant complete with stems, leaves and flowers. On the surface of the collar the sheet metal surrounding the repoussé work has been incised with arcs. This makes the La Tene design appear to stand out more from the surface. There are two terminals at either end of the collar that have a Mortice and Tenon locking device that firmly clasps the colllar together. Unfortunately, the plough that uncovered the collar more than a century ago broke the collar in two. 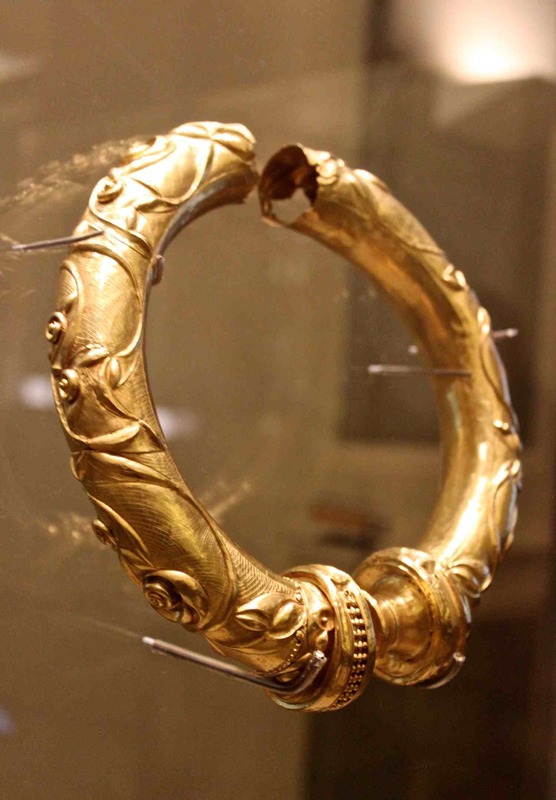 Photograph of the Broighter Collar at the National Museum of Ireland taken by Reena Ahluwalia. In this photo you can see just how high relief the pattern was made. You can also see the incised arcs in the background. Photo taken by Reena Ahluwalia. In this drawing you can see what the La Tene pattern looked like flat before it bent into a tube. 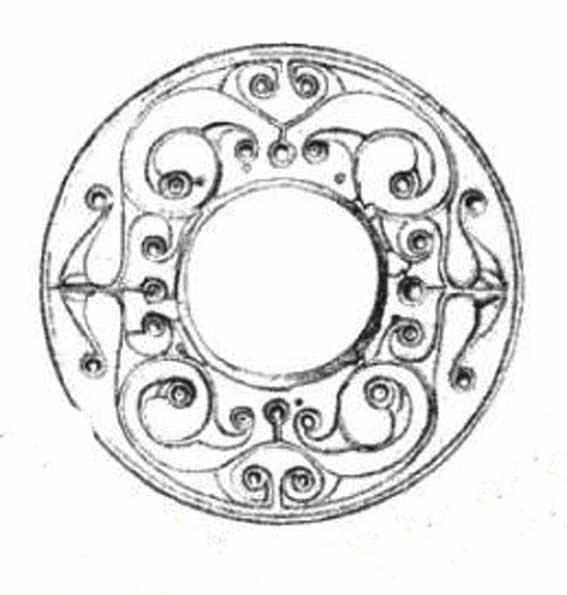 The Petrie Crown is a fine example of Celtic Iron Age metalworking which displays the curvilinear repeated patterning typical of the La Tene style. It is made of Bronze pieces which are either soldered or riveted together. It consists of a band, two discs and one horn. The base is a bronze band which was bent into a circular shape that fits onto the head. Tiny perforations running the length suggest that leather or some sort of textile was sewn to the band. A Running pattern of disc- like shapes has been cut out of the band and is decorated with a flowing La Tene Pattern. 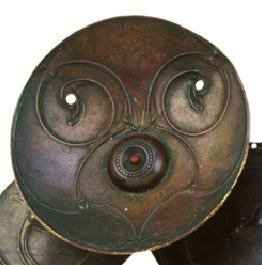 Two large discs are soldered onto this band and decorated with La Tene Trumpet Curves, the centre of some of these curves end in a bird head design. The eye sockets of the birds head would once have contained enamel. The discs are not flat, but are concave in shape. The designs are lined or carved in – ie the background of each line is carved away and smoothed so the lines appear raised. In each disc there is a boss with a mount for a bead – in one boss the bead is missing and in the other a red enamel bead remains. 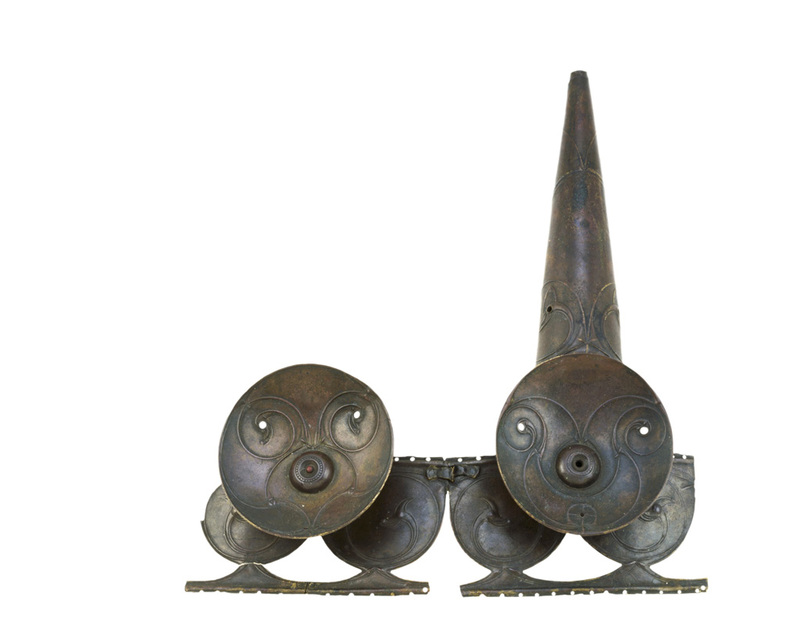 The conical horn was cut from sheet bronze, was formed by bending sheet bronze into a cone shape and joining the edges using rivets – the edges were riveted to a strip of copper laid the length of the join inside the cone . Originally there was a second horn that was broken and lost. 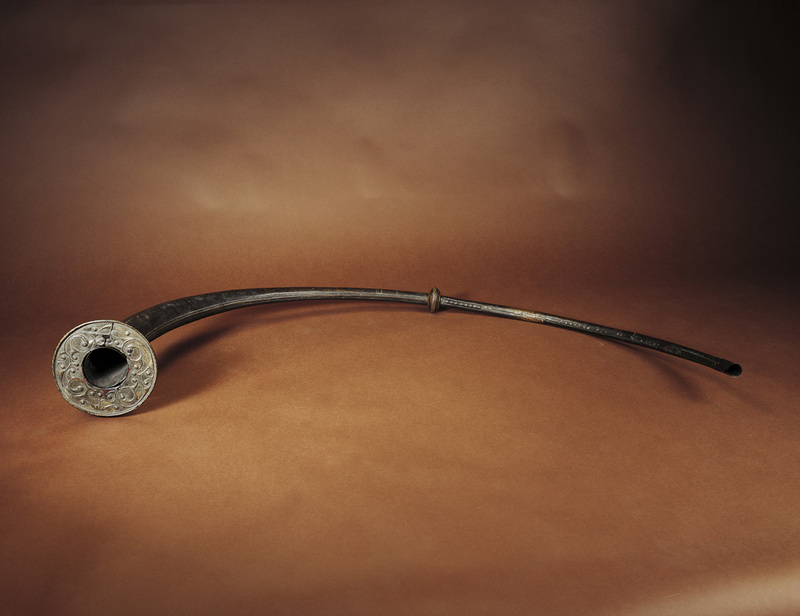 The horn is also decorated with cut away La Tene Trumpet curves and there is a mount where a bead would have been placed. This bead has since fallen out and become lost. Petrie Crown detail; In this detail of the roundel it is possible to see how the curved lines end up in a birds head. It is believed that these birds heads would once each have held an enamel bead but that these beads have since fallen out. 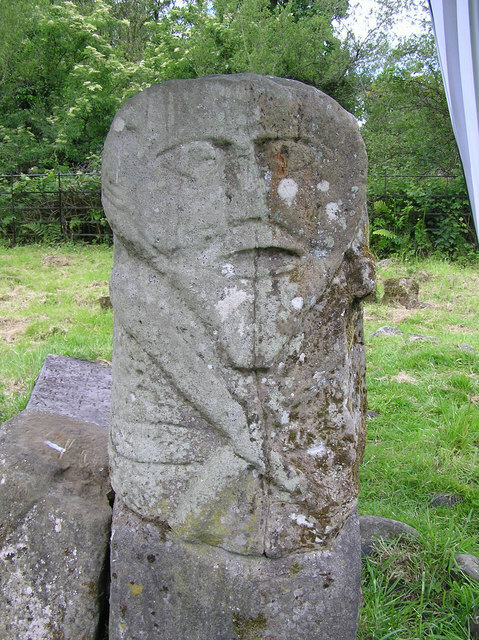 The Iron Age saw the revival of stone carving which had not occurred in Ireland since the Neolithic Era. 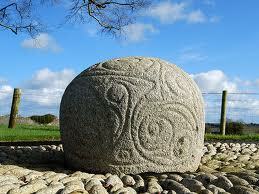 The Turoe Stone in Co Galway is the finest example of La Tene style carved onto stone. The all -over design consists of flowing leaf and Trumpet shape pattern with spirals and one triskel ( a motif of three radiating trumpet curves ). A step pattern runs along the base which is believed to be influenced from Greek Key Patterns. Drawing of pattern on the surface of the Turoe Stone. The design flows all over the surface and shows how skilled the designer was at dealing with a round subject. The pattern can be divided into quadrants with a Triskel present in one quadarant. 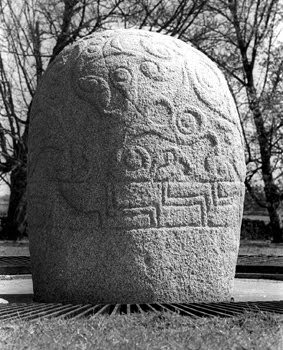 The Castlegrange stone is located in Co Roscommon. Like the Turoe Stone is is La Tene in Style. Both the stones were presumably used for sone ceremonial or religious purpose, that is now long forgotten. These stones show the influence of European Art in Ireland. Castelgrange Stone, Co Roscommon. This is another fine example of a La Tene pattern cared onto a rounded stone. The carvings of figures, which are found in Northern Ireland, date from the late Iron Age. This are the earliest examples that we see of human figures in Irish Art.They are believed to be of Celtic Gods or “Deities”. 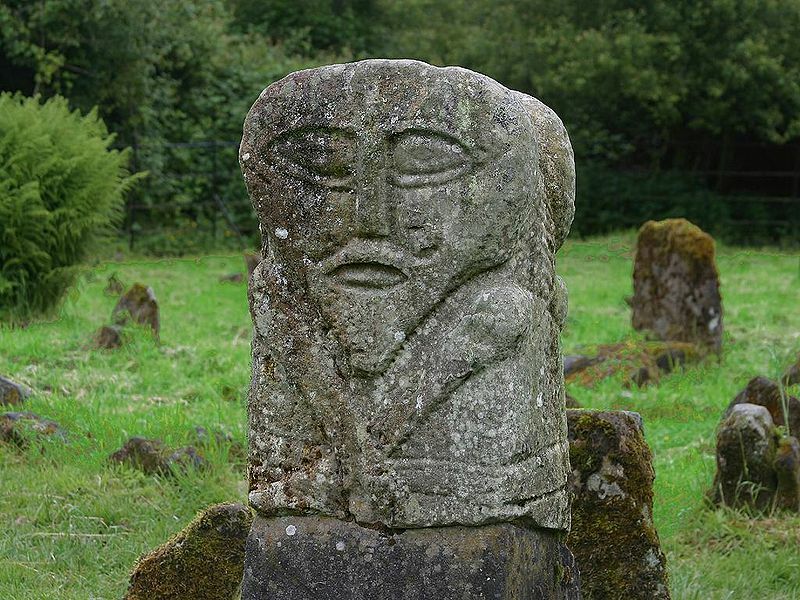 The Boa island figure is 75cm tall.It is located on an Island in Lough Erne called Boa- after the Celtic deity( Badbha – who helped warriors in battle and often appeared in the form of a crow). The carved figure has two faces – front and back and is believed to have been influenced by the Roman Art.god – Janus( who was two headed). It is believed that the Irish Celts were influenced by Roman and Christian cultures in Europe who made statues of gods or saints and prayed to them. In the southern half of Ireland there are several Ogham Stones. These are the earliest examples of Irish language been written down. These dashed lines represent letters on the Roman Alphabet. 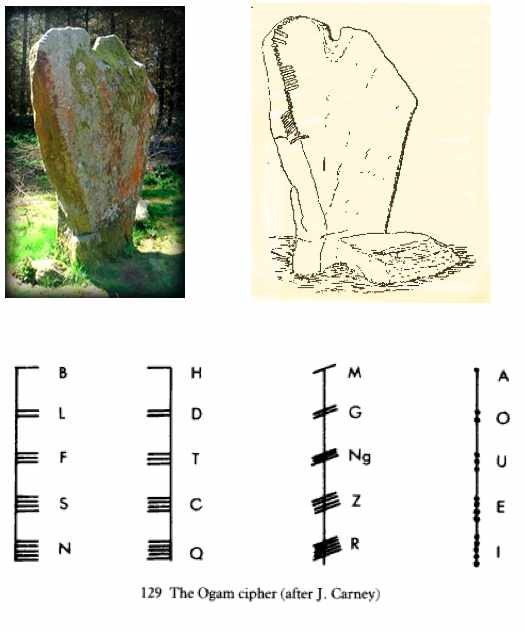 The Ogham Stone here is from Kickeen, in the Glen of Immal in Co Wicklow, and is unusual because of the heart shape of the stone.